501 Beacon is located on the south side of Beacon, between Massachusetts Avenue and Charlesgate East, with 499 Beacon to the east and 503 Beacon to the west. 501 Beacon was designed by Snell and Gregerson, architects, and built in 1888-1889 by Neal & Preble, masons, for stockbroker Francis Vose Parker and his wife, Mary (Codman) Parker. 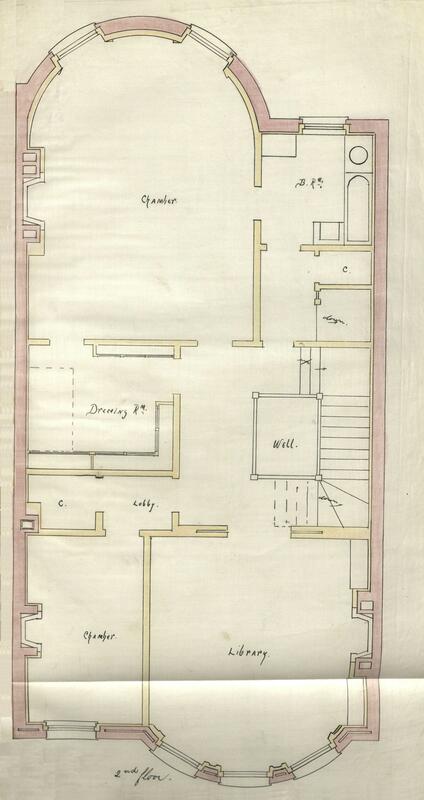 He is shown as the owner on the original building permit application, dated July 25, 1888, and on the final building inspection report, dated April 12, 1889. Mary Parker purchased the land for 501 Beacon on June 15, 1887, from Henry Lee, H. Hollis Hunnewell, and Augustus Lowell, part of a larger parcel they had purchased on February 20, 1883, from a real estate investment trust formed by Grenville T. W. Braman, Henry D. Hyde, and Frank W. Andrews. The parcel was one several tracts of land the trust had purchased from the Boston Water Power Company on March 1, 1872. 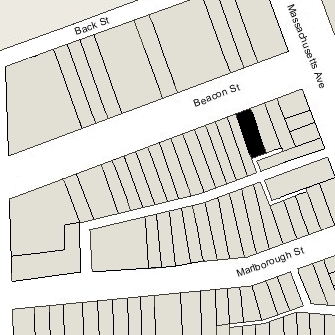 Click here for an index to the deeds for 501 Beacon, and click here for further information on the land west of Massachusetts Avenue between the south side of Beacon and the north side of Commonwealth. 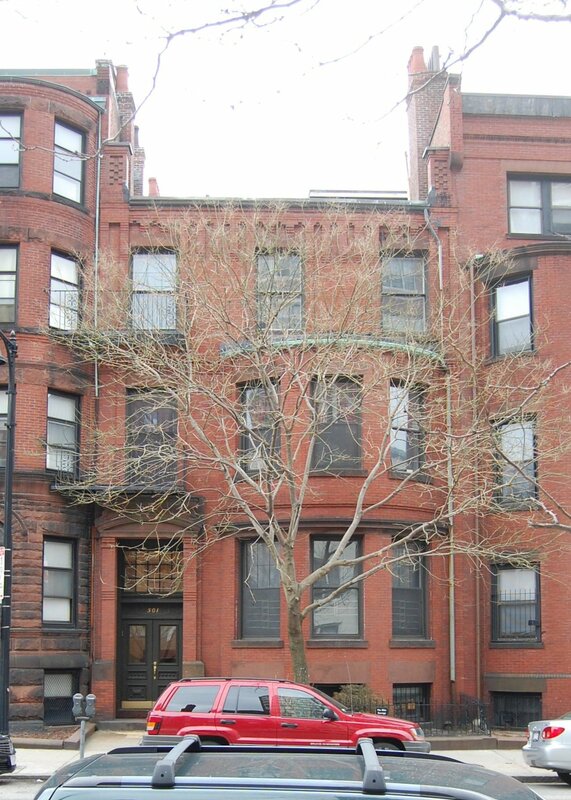 By the 1889-1890 winter season, Francis and Mary (Codman) Parker had made 501 Beacon their home. They previously had lived at 72 Chestnut. During the early 1890s, the Parkers were living elsewhere — possibly in California where Francis Parker “made two journeys” according to his Harvard Class Report (he attended Harvard with the Class of 1868 but left before graduating). During the 1892-1893 winter season, 501 Beacon was the home of Mary (Hasbrouck) Sutton, widow of General Eben Sutton, owner of textile mills in North Andover, and their daughter, Eliza (Lila) (Sutton) Young, the widow of Harvard professor Ernest Young. They had moved by the next season to 484 Beacon. During the 1893-1894 winter season, 501 Beacon was the home of William Fisher Wharton and his wife, Susan C. (Lay) Wharton. He was an attorney and had served as Assistant Secretary of State in the Benjamin Harrison Administration. They had moved by the next season and were living in Groton by 1895. During the 1894-1895 winter season, 501 Beacon was the home of John Caswell and his wife, Gertrude (Robbins) Caswell. They had married in September of 1894 and 501 Beacon probably was their first home together. John Caswell was a real estate broker and would become a noted big game hunter. They had moved by the 1895-1896 season. In the spring of 1903, Francis and Mary Parker traveled to the Bahamas, where Francis Parker died in March of 1903. Their daughter, Gertrude Codman Parker, had come with them; she met Sir Gilbert Thomas Carter, the British Governor of the Bahamas, and they married in August of 1903. In 1904, he was named Governor of Barbados, serving until 1910 when he retired and they moved to England. Gertrude (Parker) Carter is credited with designing the 1905 “Olive Blossom” one penny stamp for Barbados. In 1919, he changed his name to Thomas Gilbert-Carter. In about 1920, they returned to Barbados, where they lived at Ilaro Court, designed by Gertrude Gilbert-Carter. He died in January of 1927 and she continued to live in Barbados. During the 1903-1904 winter season, 501 Beacon was the home of Annie S. (Sawyer) Stetson, the widow of Charles Pierce Stetson. Their son, Charles Stetson, probably lived with her; he had graduated from Harvard Law School in 1903 and was beginning practice in Boston. They had moved to 439 Marlborough by the 1904-1905 season. By the 1904-1905 winter season, Mary Parker and her mother were living at 501 Beacon once again. 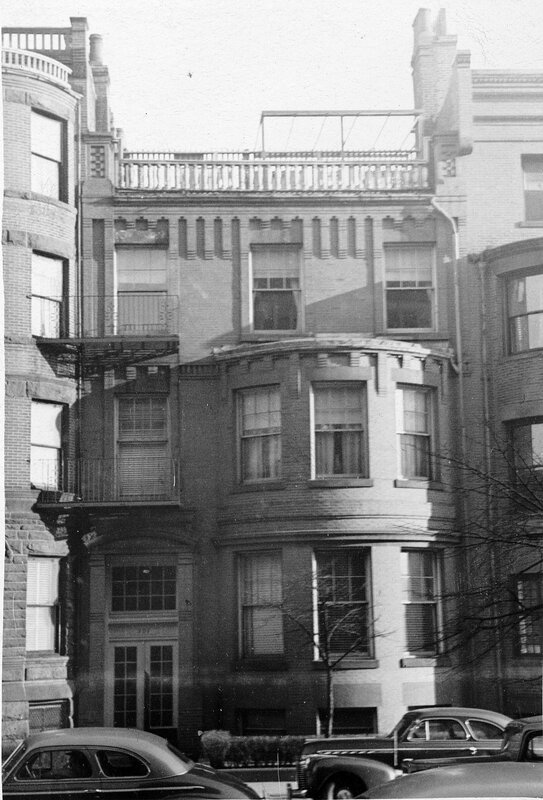 They continued to live there during the 1906-1907 season, after which they lived elsewhere for several seasons, probably traveling abroad, and 501 Beacon once again became the home of Charles Stetson and his mother, Annie (Sawyer) Stetson. They had lived at 360 Marlborough during the previous season. They continued to live at 501 Beacon during the 1909-1910 season, but moved thereafter to 19 Brimmer. Mary Parker resumed living at 501 Beacon during the 1910-1911 season and continued to live there during the 1911-1912 season. She moved thereafter, probably to Torquay, England, where she had purchased a house to be close to her son-in-law and daughter. Anna Codman lived there with her. Mary Parker died in Torquay in October of 1913 and Mrs. Codman died late the next year. 501 Beacon was inherited by Gertrude (Parker) Carter. By the 1912-1913 winter season, 501 Beacon was the home of Frederick Holbrook and his wife, Grace (Cabot) Holbrook. They previously had lived in an apartment at 330 Dartmouth. The Holbrooks also maintained a home, Naulakha, in Dummerston (Brattleboro) Vermont. It had been built by Rudyard Kipling and was his home for a number of years. Frederick Holbrook was a civil engineer. His engineering and construction firm, Holbrook, Cabot & Rollins, specialized in bridges, dams, and dry docks, and were the contractors for construction of the Charles River Bridge and the Charles River Basin dam and lock. The Holbrooks continued to live at 501 Beacon during the 1915-1916 winter season, but moved thereafter when he was made vice president of the American International Corporation, in charge of the corporation’s affairs in Russia. The Holbrooks continued to maintain their residence in Brattleboro and a Boston residence at The Tudor (northwest corner of Beacon and Joy). 501 Beacon was not listed in the 1917 Blue Book. On July 5, 1917, 501 Beacon was purchased from Gertrude (Parker) Carter by Dr. Thomas J. O’Brien. He previously had lived in Roxbury. Thomas O’Brien was a physician and professor at Tufts Medical School. He maintained his medical office at 501 Beacon. A widower, his four children – Margaret, Edmond T., Francis R., and Richard – lived with him. His parents, Edmond and Ellen M. (Hennessey) O’Brien, also lived with him. Margaret O’Brien married in 1928 to Philip M. Dillon, an engineer, and they moved to Albany, New York. Edmond O’Brien died in January of 1929 and Ellen O’Brien died in 1930. Richard O’Brien moved from 501 Beacon in the early 1930s (he was living in Adams, Massachusetts, in 1935). Thomas O’Brien continued to live at 501 Beacon with his sons, Edmond (a lawyer) and Francis (a physician), until his death in February of 1935. Edmond O’Brien moved soon thereafter to Hanover. Francis O’Brien continued to live at 501 Beacon. In March and April of 1935, Francis O’Brien acquired his three siblings’ interests in the property. On August 14, 1935, 501 Beacon was damaged by fire. Francis O’Brien moved soon thereafter. On October 15, 1935, 501 Beacon was acquired from Francis O’Brien by real estate dealer Wallace Raymond Marden. In October of 1935, he filed for (and subsequently received) permission to convert the property into seven apartments. He and his wife, Marjorie L. (Maclary) Marden, lived in Hingham and he maintained his office at 501 Beacon. On October 23, 1940, he transferred the property to himself as trustee of the Investment Realty Trust. On December 28, 1942, 501 Beacon was acquired from Wallace Marden by Harry P. Abromson, his brother, Onne Abromson, and their brother-in-law, Louis Lissack, husband of Rose Molly (Abromson) Lissack. On May 1, 1946, Harry Abromson and Louis Lissack acquired Onne Abromson’s interest and Harry Abromson then acquired Louis Lissack’s interest. Harry Abromson was president of the Pioneer Mutual Insurance Company; he and his wife, Sarah (Franklin) Abromson, lived in Roxbury and later in Brookline. Also on May 1, 1946, Harry Abromson transferred the property into his and his wife’s name. Sarah Abromson died in January of 1953. On February 23, 1956, 501 Beacon was acquired from Louis Steinberg and Jack Kosow by Harry H. Kahn. On May 28, 1957, 501 Beacon was acquired from Harry Kahn by Alfred M. Agress and his wife, Gertrude (Weiner) Agress, as trustees of the BADA Realty Trust. On January 11, 1987, the Agresses’ two sons, Bruce M. Agress and David M. Agress, released their interests as beneficiaries of the BADA Realty Trust to their parents. On August 23, 1983, 501 Beacon was purchased from Alfred and Gertrude Agress by Michael C. Stone, trustee of the 501 Beacon Street Realty Trust. On March 14, 1984, 501 Beacon was purchased from Michael Stone by Ronald F. Cahaly, trustee of the Bridge Realty Trust. On April 30, 1984, Ronald Cahaly converted 501 Beacon into nine condominium units, the 501 Beacon Street Condominium.